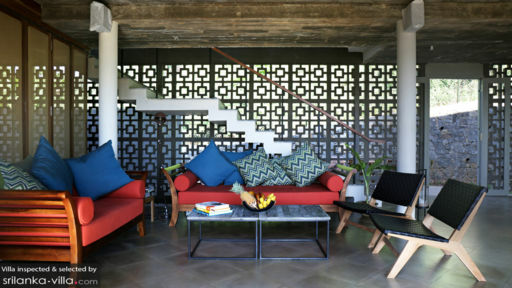 The beautiful Talalla House perches along the southern beaches of Sri Lanka. 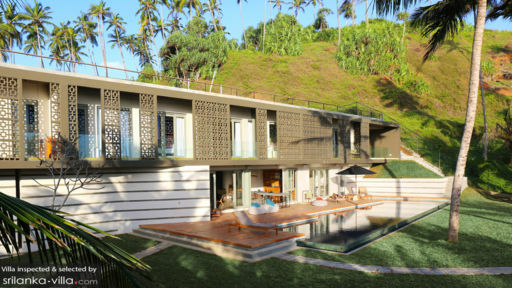 Containing a total of seven bedrooms, all of which offer uninterrupted views out to the ocean, this tropical retreat is ideal for travelling parties of 14. Enjoy direct access to a paradisiacal coast, spectacular sunsets, as well as seasonal swimming and surfing at this oceanfront home during your stay. Talalla House contains seven bedrooms; five are located in the main building, while the remaining two are garden suites (available at additional cost). All five bedrooms, each adorned with latticed windows, warm colours and classic pieces are spread out across the ground floor. Plush king beds, air conditioners, ceiling fans and impeccably decorated en suites are common to all rooms. One of the bedrooms features French sliding doors that open out to the pool deck, while the remaining four offer a balcony with views out to the ocean. A turquoise pool, equipped with wide steps and a shallow area at one end, takes center stage in the spacious garden. A timber deck frames the pool; it comes furnished with bean bags and loungers to create a comfy hangout for poolside cocktails and sunbathing. Roll out your mat in the yoga shala for an invigorating morning practice. This studio comes complete with ceiling fans, and looks out to the boundless ocean. The rooftop garden is the best spot in the house to unwind at the end of the day. Mix up your favourite sundowners at the bar, and you’ll have everything you need for a perfect evening. A magical sunset show awaits! Just like most tropical holiday homes, Talalla House features an open plan living area that opens out to the pool deck. Push open the gorgeous French sliding doors to let in the golden rays and warm sea breezes. The common spaces are tastefully decorated, with elegant furnishings, warm hues and exquisite hanging lanterns. Talalla House is a full service property with 24/7 security services and housekeeping services. Families will appreciate the availability of child-friendly amenities like a baby cot, high chair and child-minding services. The latter is available at additional cost. Other amenities available at additional cost include: laundry services, airport transfers and personal chef services. 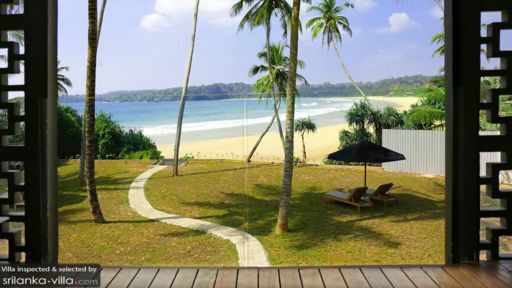 Located right along a sweeping coast with direct beach access, Talalla House is a holiday home built for beach lovers. But there’s more to this vacation rental than the sun, sand and sea. Catch the waves by taking up lessons at the nearby Bandula Surfing School, or explore surrounding attractions like Dondra Head Lighthouse, Wewurukannala Vihara, Matara Paravi Duwa Temple and Star Fort. Perfect getaway for 4 families (8 adults and 8 kids). Villa is ideally situated on the beach, set amongst a beautiful garden and poolside area. The staff are immensely helpful and accommodating and the cuisine at every meal was outstanding. Ideal for families and groups of friends. Talalla House and its staff are amazing. Location is great, on the beach and has fantastic views. The staff are the best. They looked after us so well, it was hard to say goodbye. Food was delicious. I would recommend for groups and with kids alike.